There are several types of liposuction techniques. Traditional liposuction utilizes a vacuum-like cannula to remove unwanted fat after it has been injected with saline. The most recent development in liposuction is the use of ultrasonic waves to melt unwanted fat. The technique, commonly referred to as ultrasound-assisted liposuction, (UAL), uses a cannula-like device to deliver the sound waves to specific areas of fat that have been injected with a saline solution. Once the fat has been melted, it is then suctioned from the body. Another technique is Laser Liposuction (Smart Lipo) where the Laser is used to break down fat prior to its suction This even more novel state-of-the-art technique has the double advantage of minimizing blood loss since the Laser beam seals off any bleeders, and also inducing skin retraction since the Lase beam applied to the under-surface of the skin stimulates it to retract. Liposuction can give you the “boost” you need to further improve your self image, but must be combined with to a proper diet and exercise regimen to obtain the maximal results for body contouring surgery. In the arm and thigh, what matters is not how much weight of fat we remove, but rather how we re-sculpt the area to return to the ideal contour of the arm or thigh. During your consultation, you will learn in depth about the liposuction surgery, its advantages and disadvantages, and discuss your particular needs and concerns. Dr. Wilson will examine you and consider such factors as the quality of your skin tone and the contour of your body. He will explain which surgical techniques are most appropriate for you to give you the best result. You may also schedule an additional consultation to view computer imaging so that you can visualize the results of the surgical technique that Dr. Wilson has specifically designed for you. Local or general anesthesia is used for patients undergoing liposuction surgery. Prior to anesthesia, Dr. Wilson will mark the areas to be treated on you with a surgical marker. The areas marked in blue can be safely traeted, while those marked in red are better off left untouched. Once you are under anesthesia, a salt-water solution containing local anesthesia and adrenaline is injected into the areas to be treated and small, inconspicuous incisions are made for the insertion of the cannula. The cannula, which is connected to an ultrasound generator, is inserted beneath the skin and the ultrasound application causes the walls of the fat cells to break down and melt. 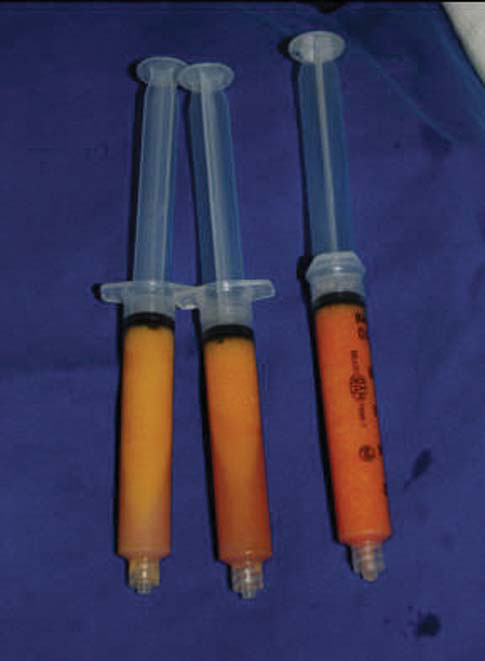 This melted fat combined with the injected fluid creates an emulsion that is removed from the body by low vacuum pressure. After the procedure, the incisions are closed and you are dressed into a compression garment which helps to reduce swelling. 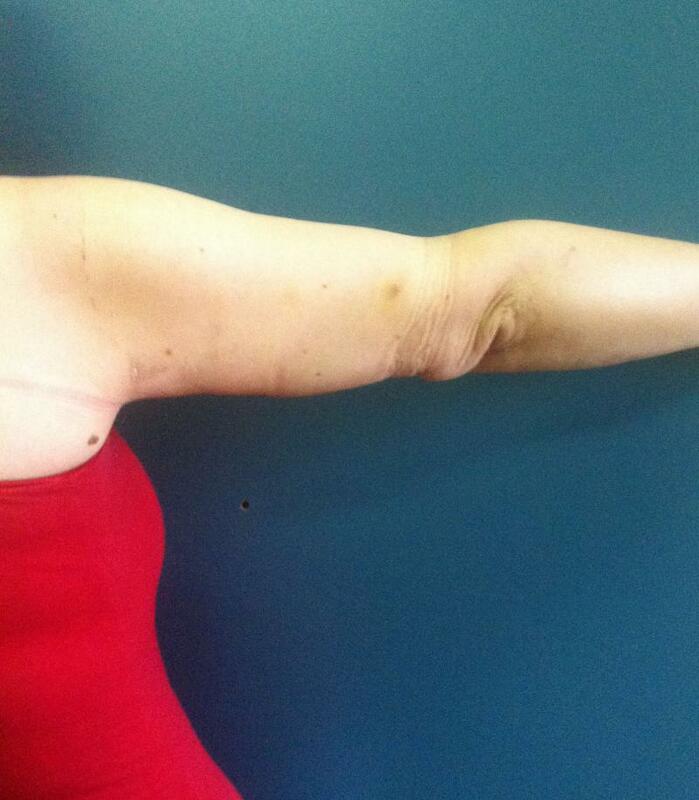 Arm Liposuction: This 46 year old female had excess fat and redundant skin in the arm. 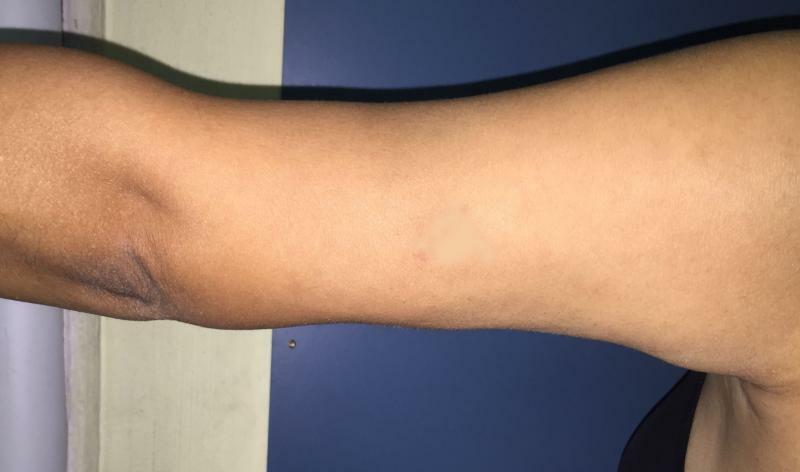 Laser Liposuction and excess skin excision were performed through an invuisible scar in the arm-pit. 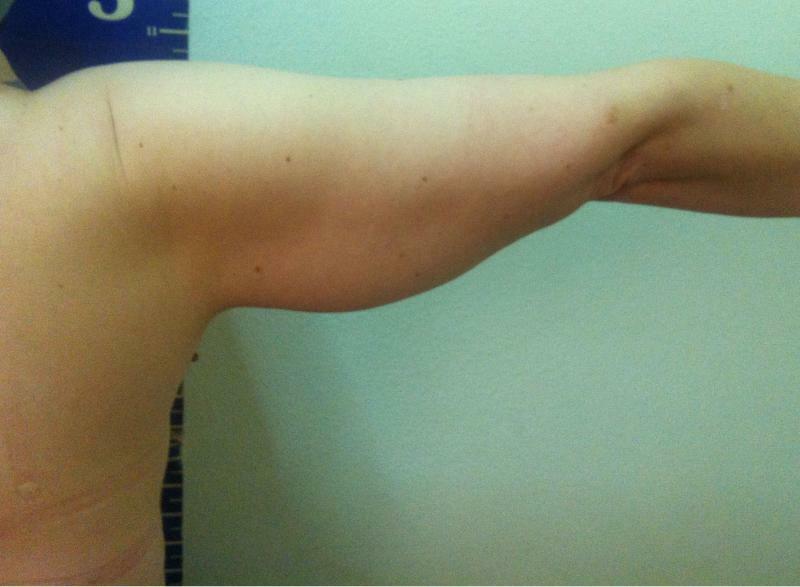 Arm Liposuction: This 25 year old female had excess fat and redundant skin in the arms after gastric banding. Liposuction and excess skin excision were performed. 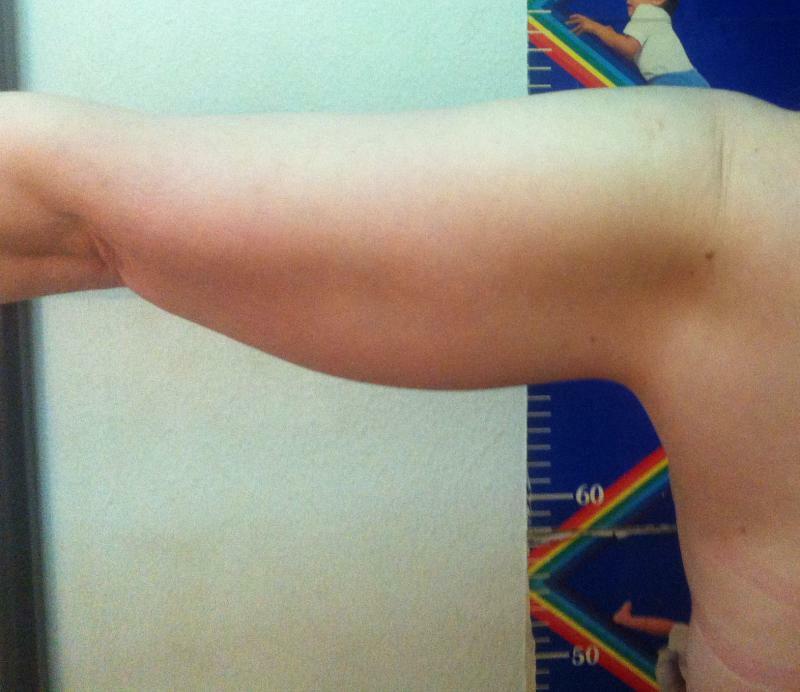 Arm Smart Laser Liposuction: This 44 year old female had excess fat and redundant skin in the arms after gaining weight. Laser Liposuction was performed.﻿ Note the excellent contour attained on both sides. Combined Arm Liposuction and excess skin excision: This 39 year old female had excess fat and redundant skin in the arm. Liposuction and excess skin excision were performed and the scar was placed in the axilla. Thigh Liposuction: This 37 year old female had excess fat and redundant skin in the thighs, at the front an inner parts. Liposuction of 2700ccs of fat was performed using Laser Liposuction (Smart Liposuction). Hip and Thigh Liposuction: This 19 year old female had excess fat and redundant skin in the hips and outer and inner thighs. Smart 4-D Laser Liposuction of 6000ccs of fat from the hips thighs were performed leading to a toned more aesthetic appearance. And picture 3 days after the surgery. Note absence of any bruises or dimples. Hip and Thigh Liposuction: This 27 year old female had excess fat and redundant skin in the hips and thigh. 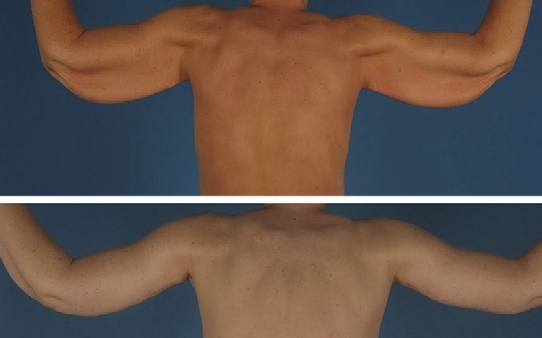 Liposuction of 8000ccs of fat was performed on two sessions 3 months apart. Hip and Thigh Liposuction: This 22 year old female had excess fat and redundant skin in the hips and inner thighs. Liposuction of 1000ccs of fat from the hips and 1500cc from the inner thighs were performed. Hip and Abdominal Liposuction: This 49 year old female had excess fat and redundant skin in the hips and abdomen. 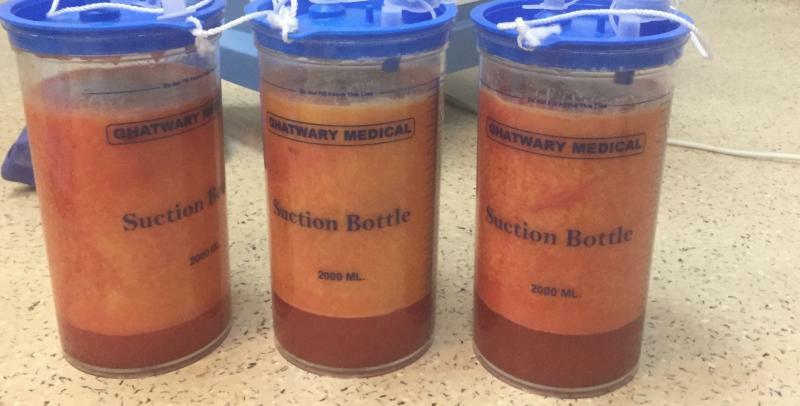 Liposuction of 3000ccs of fat from the hips and 1000cc from the abdomen were performed. Inner Thigh Laser Liposuction: This 24 year old female had excess fat and redundant skin in the inner thigh and around the knee. Laser Liposuction of 900ccs of fat was performed yielding a very natural result and removal of all fat in between the thighs.